HLHB Weekly Update – September 24, 2010 – +600 pips! What an exciting week it has been! Aside from the return of Glee and Gossip Girl, the market came up with some eventful shows of its own. A major market mover this week was the latest European bond auctions in Ireland, Spain, and Greece. This seemed to boost investors’ spirits, allowing other higher-yielding currencies to rally as well. A quick shoutout to the Aussie, which scored a new yearly high against the Greenback! Speaking of the Greenback, it turned out to be a big loser this week after the Fed released a dovish monetary policy statement. Sure, they didn’t exactly specify whether they’d implement more quantitative easing or not but the fact that they’re keeping doors open for it was enough to get the Greenback dumped. Ouch! What’s more is that the dollar has been selling off against everything, even against other safe havens! Just look at the dollar’s performance against the yen. Even though there are some major concerns that the BOJ might intervene again, USDJPY is slowly crawling back down the charts! And dont’ even get me started on USDCHF! A quick look at the charts shows that it’s now 150 pips below parity with the US dollar! Poor, poor dollar. If only you were a cute, fluffy unicorn, then I’d play with you all day long! But no, I must benefit at your expense! September 13 – A bullish crossover happened and stochastics was not yet oversold so, according to the HLHB rules, I went long at 1.2829. The stop on both of these positions should be 10 pips below the candle prior the crossover candle or 150 pips, whichever smaller. Also, the combined risk of both positions should equal to 1.0%. 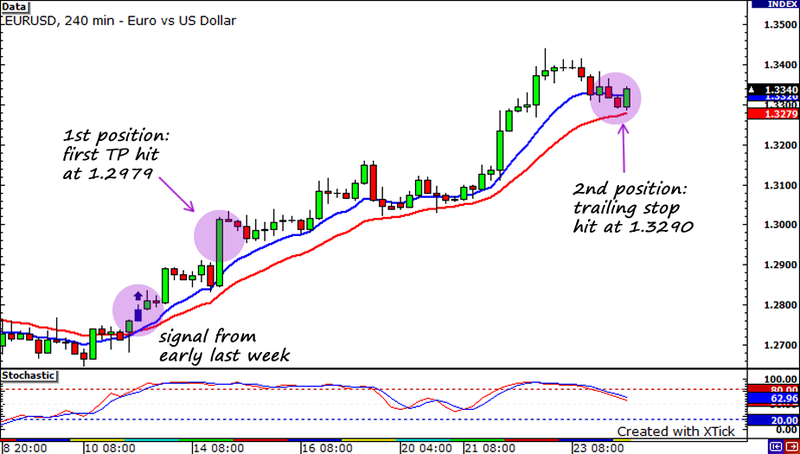 September 14 – My first position hits profit target hit at 1.2979 (+150 pips). I put a trailing stop of 150 pips on my second position. September 24 – My second position from 1.2829 hits a high of 1.3440, then drops down to 1.3290 and hits my 150-pip trailing stop (+461 pips). I won’t deny it, I am PRETTY glad right now. For some reason, I always seem to catch a good move and make up for my losses – and then some – when I am really down. I guess that’s one thing that you must have as a trader: perseverance. Now it’s time to enjoy my weekend. It’s been a pretty busy week at work and I’m looking forward to some down time. I think I’m going Time to watch that latest episode of Glee! I hear that the new Filipina girl is pretty good and that there’s a new hottie to take the spotlight away from Finn! Hmmmm…. interesting!